Kerry “KC” Cameron. aka “Captain Kid” has had an interesting life. Growing up in rural Alaska the son of an Alaska native missionary; Kerry’s native heritage led him into a professional native dance group that traveled through Europe and North America as a teen. This is where he was hooked by the “performance bug”. After graduating, Kerry joined the Army and was in 5th Special Forces, and re-enlisted to go to DLI language school for Russian. After getting out of the Army, Kerry went back to Alaska and worked his way through school as a logger and commercial fisherman. His major was Philosophy – because of the money. After college Kerry became a counselor to at-risk youth. These were kids that had been abused by their parents and had severe social and mental issues. During this time Kerry became interested in performing magic, and was hired by restaurants in Fairbanks, AK. He eventually started working birthday parties for kids, and then adults. Kerry’s interest grew, and he went to school for hypno-therapy and began performing as a “G” rated hypnotist and then stage magic for families and adults. Kerry has worked all over the United States, Germany, Italy, Greece and Turkey. Kerry is now married to Sheree, a bankruptcy attorney, and has an autistic son, Aidan. Why Captain Kid is the Best Choice for your Birthday Party or School Event! They call him “Captain Kid” for a reason . 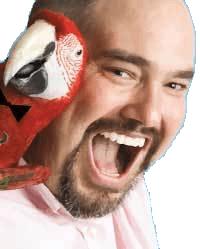 . . over three DECADES of being a full-time professional children’s entertainer and magician, he has discovered what kids and parents want, and provides a “barn-burner” of a party– a true PROVEN value, with more laughter crammed into an hour than you can find ANYWHERE! Take lots of pictures and video so you can remember your child’s giddy face – they grow up so fast! Like you, he is actually a parent! – Most children’s “entertainers” do not have nearly this much experience. You are provided with astonishment, excitement, giggles, roaring laughter, and sheer delight packaged in a fun-loving, family-friendly, hilarious comedy magic show!